ICv2 is reporting a second of year growth for the North American manga market. The article cites Attack on Titan as a big driver of sales, but also mention that Viz’s shojo manga sales have risen. Sticking with ICv2, they recently ran a two part interview with Dark Horse’s CEO Mike Richardson, Director of Licensing Michael Gombos, and manga editor Carl Horn. On the, “oops I missed it” licensing news front, Viz’s Shojo beat will be adding Amu Meguro’s Honey So Sweet, and Akaza Samamiya’s Bloody Mary to their line up. It was recently announced that ONE and Yuusuke Murata’s One-Punch Man will be receiving an anime adaption, with more information and a promotional video appearing at Anime Japan 2015 later this month. Considering how amazing some of the visuals in that series is, it’ll be interesting to see how the anime looks. On a more somber note, Yoshihiro Tatsumi passed away last week. He was a pioneer of the gekiga, whose works have earned such honors as Angoulême’s Prix Regards slue monde award in 2012, and the Osamu Tezuka Cutlture prize in 2009. Several of his works have been released in the U.S. by Drawn & Quarterly, including A Drifting Life, Black Blizzard and Abandon the Old in Tokyo. And finally, the New York Times Best Sellers List for the week of March 22nd. And now onto this weeks review of Prophecy, Vol. 2! In a story that could be ripped from today’s headlines, Tetsuya Tsutsui’s Prophecy, Vol. 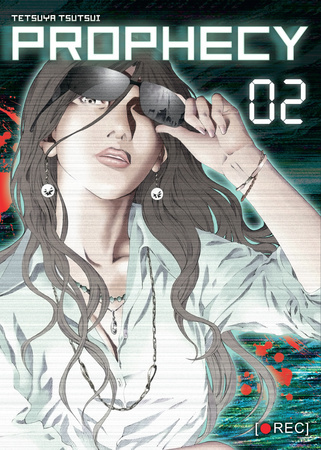 2, follows the Lieutenant Yoshino and Japan’s Anti Cyber Crimes Division getting ever closer and closer to uncovering and capturing the identity of the enigmatic cyber terrorist known only as Paperboy. As his attacks become more political and more high profile, one of his accomplices faces a crisis of conscience that could prove to be Paperboy’s undoing! Prophecy, Vol. 2 is definitely an interesting read and one that feels incredibly relevant in today’s ever more interconnected society. Tetsuya Tsutsui weaves a tale which looks at the familiar issue of anonymity on the internet, mixed with other concerns and issues faced by modern Japanese society. The result is a cyber thriller that’s both familiar but different from similar stories here in the U.S. Some of differences are more obvious than others, such as the Sea Guardians, a thinly veiled reference to the controversial Sea Shepard organization being a target, something that would mostly likely be absent from a similar tale taking place in the West. Other moments might be easy to miss or mistake for similar scenes in the U.S. as well. The hordes of people showing up to record a possible murder, for example. While a similar scene wouldn’t exactly be out of the question in the U.S., I found it difficult not to see the event as an echo of the Akihabara massacre from 2008, which allegedly involved several people live streaming the attack and its immediate aftermath. On the other hand, surrounding this interesting premise and littered throughout the story are characters who’re almost cartoonishly over the top at times. The highway police officer drooling over Lieutenant Yoshino, or Yoshino herself who boldly stakes her career upon a single stake out in a scene that feels like it’s right out of a Hollywood blockbuster. Even the Sea Shepard stand-ins get in on the over the top antics when they’re shown to be practically cackling with glee as they try and smear the Japanese police because they were given a male officer to guard them instead of an attractive woman office. All these little moments detract from the more serious and fascinating premise and result in Prophecy, Vol. 2 having a rather odd feel to it at times. The artwork’s solid and depicts everything in a clear and easy to follow manner, but I wasn’t really blown away by Tetsuya Tsutsui’s visuals. The internet cafes, the busy streets and more are all nicely rendered and do a lot to help the contemporary and modern feel of the story. Even including characters in the background help lend a sense of weight to the story, implying that there are people who could be affected by Paperboy’s events beyond his targets and those pursuing him. Paperboy himself is clearly the most standout design and thanks to the newspaper mask and really snazzy looking t-shirt which is designed like a typical iPad or tablet interface he cuts a rather dashing and memorable figure. Prophecy, Vol. 2 was a solid and engaging read, but it didn’t quite blow me away. That said, it did intrigue me. It was definitely interesting and different enough that I’ll be tracking down the other two volumes in the series in the near future and I’m looking forward to getting to read the entire series in a single sitting. If you’re looking for a different, contemporary series that tells a story that’s relevant to the modern society, then this is absolutely the manga for you. Prophecy, Vol. 2 is available now from Vertical Comics. Review copy provided by the publisher. Categories: Manga Reviews, Reviews Tags: Prophecy, Tetsuya Tsutsui, Vertical Comics, Vertical Inc.